Twitter has a new photo-uploading tool, that can be used through third-party photo-sharing services such as yFrog, TwitPic or Instagram, and your photos will soon be featured on your Twitter profile in an image gallery. Twitter is rolling out user galleries, as the feature is called, to members beginning Monday. Galleries will automatically display the 100 most recent images the user has shared by way of Twitter — dating back to January 1, 2010 — from supported photo-sharing services. 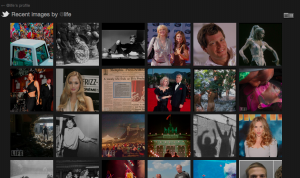 Galleries will live on a user’s profile and highlight a few recent images. A visitor can click the “view all” button to see even more images in either a grid view showing image thumbnails or a detail view highlighting the most recent image and the text of the tweet that was shared along with it. The update ties into Twitter’s photo-sharing push and will dramatically change the appearance of Twitter profiles. Galleries will provide equal billing to images shared via third-party app makers, but also serve to remind users that Twitter is no longer a place just for 140 characters — it’s for photos too. The update is likely designed to entice Twitter users to add more photos to their tweets. Galleries, at launch, will be image-only. Twitter Communications Manager Carolyn Penner said in a tweet that users can expect to see the update Monday. “We’re rolling out one of my fave features today: user galleries! View photos an account has shared on Twitter. Sit tight – it’s coming soon,” she tweeted.